I’m not going to pretend I know anything about authentic pulled pork. I’ve made a barbeque version before, which basically consisted of cooking a pork shoulder covered in barbeque sauce in a crockpot all day. Probably something a chef capable of making actual pulled pork would laugh at. But we like it, so it worked…until now. We bought some pork sirloin tip roast at Costco last week. I didn’t have a plan for it, I just liked the nutrition stats. I wasn’t sure if it had enough fat to use as pulled pork, but we had a bunch of burger buns left over from a party we were trying to use up, so I went for it. As usual, no recipe I could find made me completely happy, so I made my own. Preheat the oven to 325 degrees. My roasts were about 2 pounds each, which I didn’t think would be enough, so I used two. Rinse the roasts and pat dry. Place in a Dutch oven. 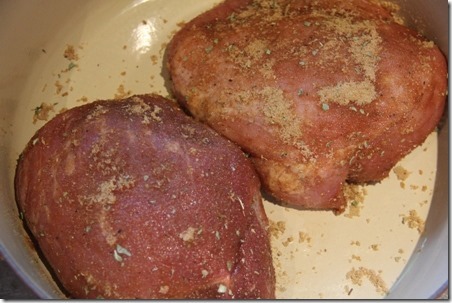 Rub the mixture into the meat on all sides. Combine 12 ounces of beer (gluten-free if that’s your thing) and 1 tablespoon liquid smoke. Pour down the side, not over, the meat. Cover tightly with a lid or foil. Place on the bottom rack inside the oven and cook for 3 hours. Since I was cooking two small roasts, you might need to cook it longer if you’re working with one larger roast. Cook until it reaches a safe temperature on your meat thermometer. Remove from the pan and shred by pulling apart with two large forks. We served this on pub-style hamburger buns, generously drizzled with barbeque sauce and topped with pickle slices. My girl had hers on a toasted gluten-free bun. This was a winner with the entire family, but my daughter liked it so much we’re having it for her birthday dinner later this month with a side of coleslaw. I’m going to try making it with hard cider (still gluten-free) instead of the beer. It can’t come soon enough – just revisiting these photos is making my mouth water.